The military history collection at the New Brunswick Museum effectively began after World War I and the return of veterans from overseas who donated their uniforms, weapons and memorabilia as well as captured enemy souvenirs. Thereafter the collection deepened and broadened to include the present significant holdings of New Brunswick peace time militia uniforms from the 19th through the early 20th century and conflict era examples from both world wars together with post-1945 acquisitions. Army uniforms are most extensive with selective representation from the Royal Canadian Navy and Royal Canadian Air Force. A strong army insignia collection is featured, especially Canadian badges from World War I. There are as well outstanding signature items such as belt plates from the American Revolutionary War, War of 1812 and the19th century militia. The military component of the weapons collection features a solid collection of firearms and edged weapons ranging from the 17th to the 20th century and an important and early assembly of Imperial Army maps and plans dealing with fortifications and barracks from New Brunswick’s colonial era. 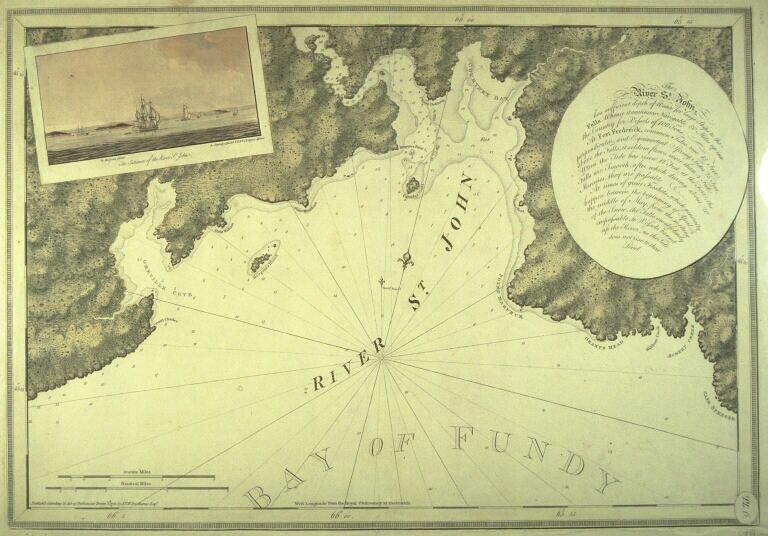 In the same time frame, coastal sea charts of the future New Brunswick by J.F.W. Desbarres in the late 1770s the Royal Navy during the late 1770s lend an engaging portrait of the mapmaker’s art for military purposes. Acquisitions of militaria continues strongly today, especially from surviving veterans of the Second World War or family members honouring their memory. While early museum records document the donation of the 1839 ship model Britain’s Queen in1853, the New Brunswick Museum’s marine history collection only began to develop towards its present depth during the 1920s. Thereafter an impressive series of navigational instruments, sea captain’s charts, ship models, ship carpenter’s and sail maker’s tools were acquired. Smaller allied collections include ship smithing iron and sail rigging equipment. While ship models represented the finished product, builder’s half models embodied the lines of the future vessel as laid out by the shipwright in moulding lofts. 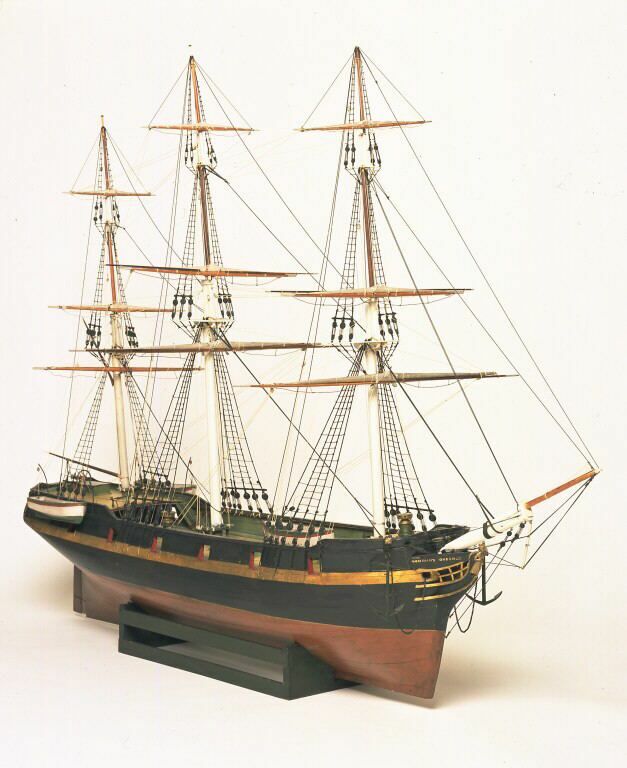 There is an eclectic collection of these models which range from ships to barques, schooners and pleasure yachts. The rise of the marine architect is also represented in several vessel plans dating from the mid-nineteenth century on. The early labour movement has strong representatives in the marine history collection. In the same year that Britain’s Queen was donated to the museum, it was hauled through the streets of Saint John in a parade featuring 5,000 workingmen from various trades celebrating the sod turning for the European & North American Railway. The magnificent banner of the John Quail firm of ship riggers and the huge eleven foot long model of the ship Robert Reed were also featured in this parade which is recognized as a landmark in New Brunswick and Canadian labour history. The marine collection is augmented by several working craft, including two Saint John Harbour Salmon skiffs and a log dugout canoe for commercial salmon fishing in Miramichi Bay. Fishing nets, floats, tar pots, barrels, barrel. Stencils, small gasoline engines and boat models compose the remainder of a small but good collection. Scientific apparatus formed a part of this collection’s history since the days of the Mechanic’s Institute Museum in the 1840s. Physical representation and depictions of scientific concepts remained important through the years whether as a patent model for a 19th-century monorail passenger car, W.R. Turnbull’s designs for a variable pitch airplane propeller in the 1920s or Vincent Theriault’s prototype of an egg-shaped lifeboat called Esperanto from 1991 that later went into commercial production. A 19th-century version of research and development resulted in the low slung sloven wagon used in Saint John and other port cities to load heavy cargo while a twentieth-century counterpart, albeit American led and more controversial, resulted in the short-lived Bricklin sports car produced in New Brunswick during 1974-75. Collections which also illustrate the refinements of research and development include the New Brunswick Power and New Brunswick Telephone Company replete with testing devices and finished products. The recent acquisition of the Nurses Association of New Brunswick Artifact and Archival Collection, including the instruments and equipment of Fredericton physician Dr. Frank Ramey (1900-1987) expands the opportunity to study medical advances and standards of care, particularly in the twentieth century. The nursing component also permits review of the work experience and forms a link with the more traditional resource-based and craft industries of the nineteenth century. Tools and equipment relating to the woods industries, agriculture, candy making, printing, and shoemaking lend insight to daily life and pride of workmanship, this in particular demonstrated by a magnificent set of house joiner’s tools used by three generations of the Beatteay family in Saint John. Governmental, sporting, and ceremonial weapons have a predictably eclectic feel, ranging from a shotgun made in Saint John to a Sharp’s ‘buffalo gun’, an early police revolver and a dueling pistol set that may have been used in one of the last such confrontations in mid-19th century New Brunswick. Decorative powder horns, fraternal swords, black jacks and brass knuckles give some indication of variety in this collection. The domestic map and plan collection features several areas of strength, including a number of good early 17th and 18th century regional and provincial maps. Provincial and community coverage is strongest between the mid-nineteenth century and the 1920s. The plan collection features work by Saint John architects John Cunningham and Matthew Stead as well the engineering drawings for the European and North American Railway (c. 1857-60) and W.R. Turnbull’s shop drawings for his aeronautical projects (c. 1900–1940).